The 2018 May World Championships have concluded, and Daniel Taylor has once again claimed the title of Star Wars™: Imperial Assault World Champion with his Mercenary strike force. However, the Mercenaries certainly weren't the only faction to make a strong showing at this year's World Championships. As Daniel had predicted in his article, "Imperial Resurgence," this year's World Championship boasted one of the game's most diverse and competitive fields to-date. We saw every faction represented among the Top 16, and we're thrilled by what this suggests for the 2018 Star Wars: Imperial Assault Store Championships! The 2018 Star Wars: Imperial Assault Store Championships are your chance to take advantage of everything we've learned from the recent World Championships—and to explore new possibilities within the game. They're your chance to enjoy battles that are a step higher than the standard Entanglement Tournaments supported by the game's Seasonal Kits, they offer you a shot at local bragging rights, and they come with prizes that—like the competition itself—mark an annual high-point for your in-store tournaments! 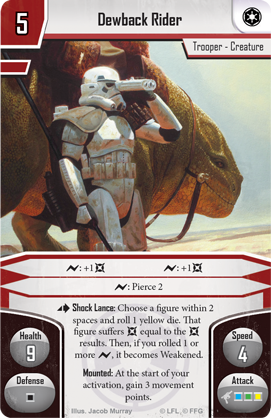 This year's World Championships marked the Galactic Empire's strongest showing in years, and the Top 32 players at each 2018 Star Wars: Imperial Assault Store Championship gain a card that reflects the faction's reinvigorated strength and versatility—an alternate art Dewback Rider. With dusty and evocative art by Jacob Murray, this card depicts your Dewback Rider scanning the wastes of Tatooine for any potential threats to the Empire. Of course, his trusty dewback is right beside him, ready to race into action at a moment's notice! 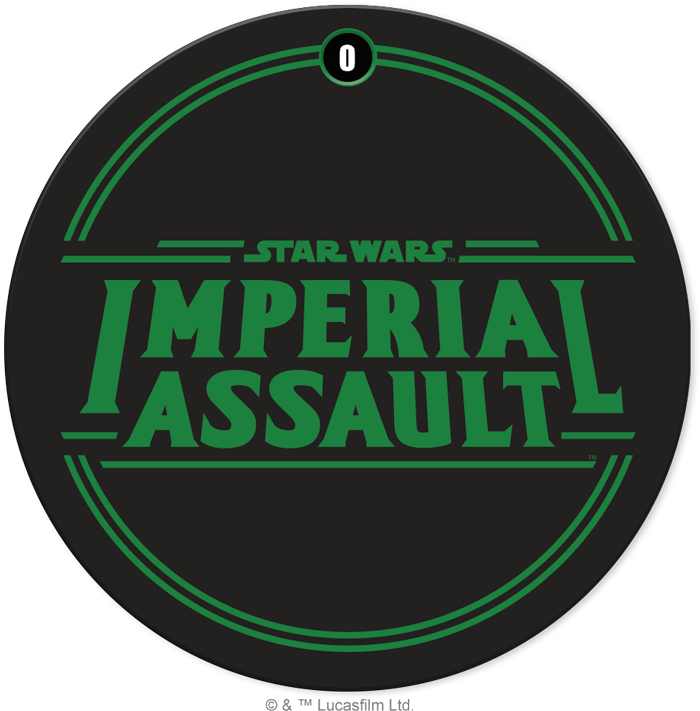 Battle your way into the Top 4 at a 2018 Star Wars: Imperial Assault Store Championship, and you'll win a custom point dial that proudly displays the game's logo. This isn't just a cool prize and a useful tool to bring into your final matches; it's also a valuable reminder that you're not fighting just to destroy enemy units—you're fighting to win a war. And the way you win that war is to be the first to 40 points! You'll need a truly heroic effort to make the Top 2 amid all the blaster fire and melee action at your 2018 Star Wars: Imperial Assault Store Championship. As a result, you'll be rewarded with a special spot-glossed alternate art version of the Heroic Effort skirmish upgrade on plastic. 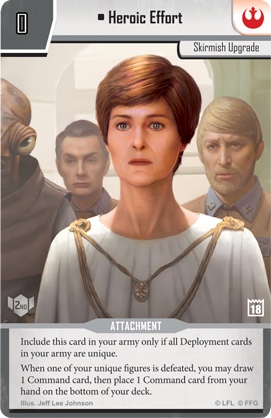 The art by Jeff Lee Johnson suggests the faith that Rebel High Command has invested in your efforts, depicting the seriousness with which Mon Mothma and the other Rebel leaders view the task before you. And while the alternate art would, by itself, make this a fantastic reward for any Rebel player, you'll find your placement further rewarded by a foil stamp that celebrates your success each time you set this card on the table. Once all the blaster fire has ended, after all the dust has settled, each Store Championship can only crown one Champion. Will it be you? If so, you'll have earned local bragging rights, having claimed your store's highest title for a whole year. You'll also have put yourself in a great position to succeed at your next mission. 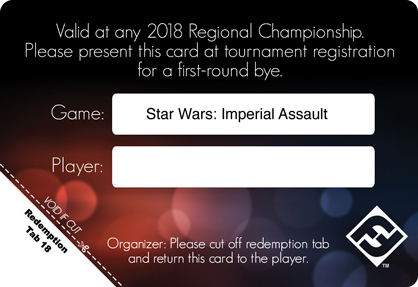 Each 2018 Star Wars: Imperial Assault Store Champion will earn a Prize Bye for use at a 2018 Star Wars: Imperial Assault Regional Championship. After all, the Star Wars galaxy is a vast place—and full of powerful conflicts. Once you've claimed your favorite local gaming store for your favorite faction, there's still your Regional Championship ahead of you, as well as your planet, the Outer Rim, and the whole galaxy! Assemble your strike force, and be sure you pay close attention to your command team. 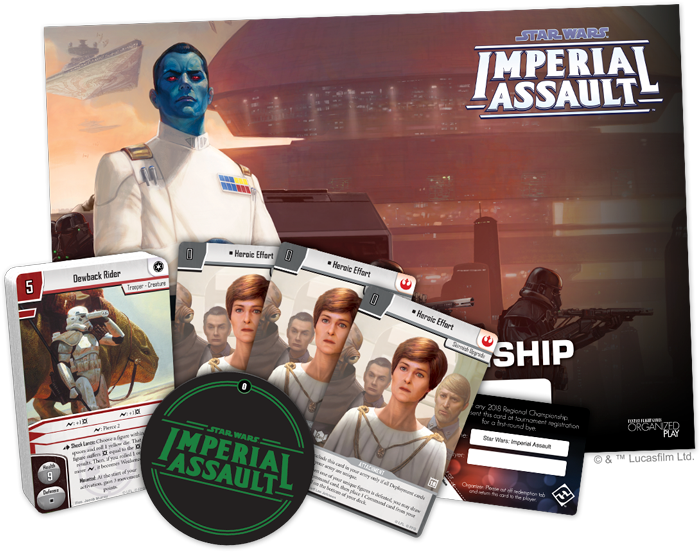 The 2018 Star Wars: Imperial Assault Store Championships mark a yearly high-point for local in-store play, and you'll want to be ready ahead of the initial engagements. Find out when your favorite local game store is running its Store Championship; talk to them today!